Police capture suspected terrorist on Jerusalem-Tel Aviv highway. Suspicious package carried by terrorist transferred to bomb squad. Israeli police arrested a suspected terrorist en route to Jerusalem Wednesday morning, amid suspicions he was planning an imminent attack in the capital. 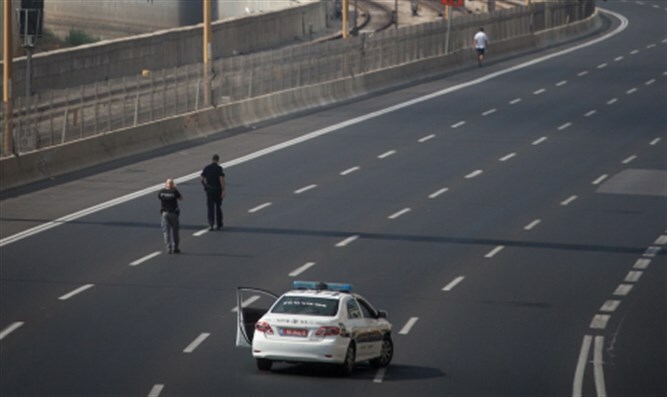 Police apprehended the suspect on Highway 1, the main transportation artery linking Tel Aviv and Jerusalem. The suspect has been identified as a resident of eastern Jerusalem in his 20s. Authorities say the suspect had in his possession a suspicious package at the time of his arrest. A police bomb squad has been called to assess whether the package poses any threats. Police closed traffic on east-bound Highway 1 from Shoresh junction due to the arrest and concerns regarding the suspicious package.